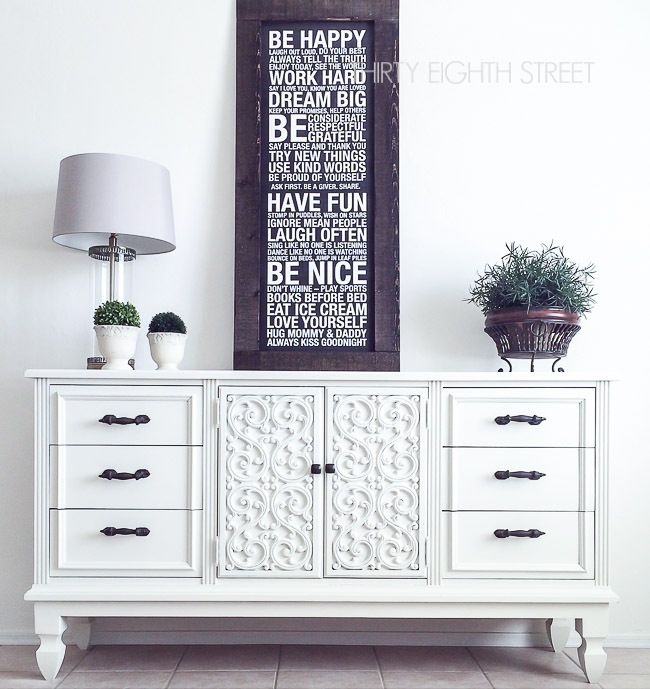 Give your boring old furniture some custom style and learn how to add legs to furniture easily! 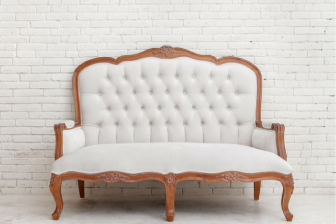 Attaching feet to your furniture is a great way to update your furniture and give it high end style without breaking the bank! 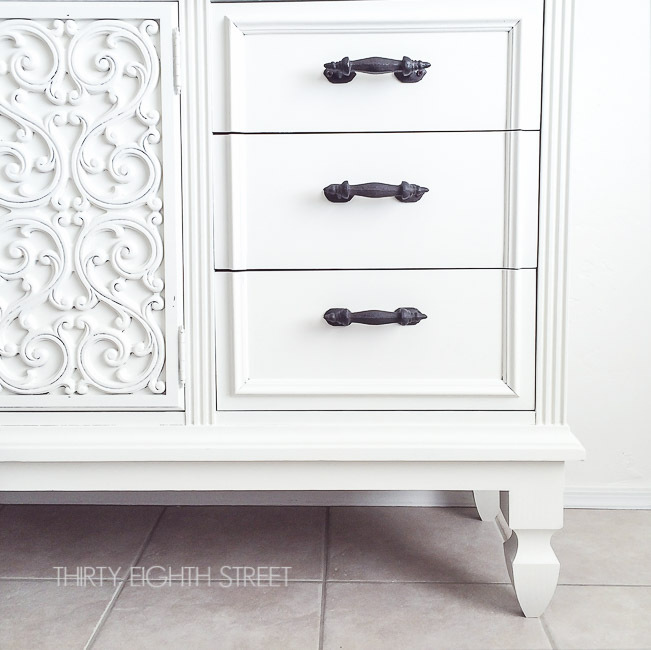 You'll never believe what we used for legs for this DIY furniture project! Good morning! It's the start of a new week and the beginning of a new month. A month that includes an especially tender holiday for me. What makes this day so special? I usually get breakfast in bed. Children that try extra hard to be extra awesome! Becoming a mother has been one of my greatest joys. Meet my mother, Andrea who is the inspiration behind this next furniture project. Some people call her Andrea but her friends call her, Andi. There are three things that I'd like share about my mom. The first is boy is she FUN! 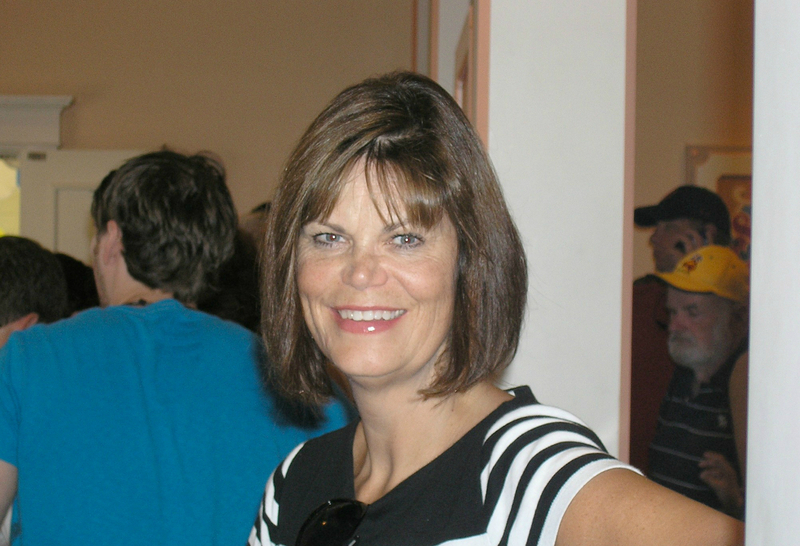 This lady is easy going, has the best sense of humor, and is usually the first person to laugh at her own mistakes. For that I will be eternally grateful..Thanks, Mom! And last, I recently had the absolute pleasure of helping my mother perform a total gut job on her 1970's home complete with blue carpet, toll painted borders and yellow formica kitchen countertops. With my mom in mind, I decided to fix up this discarded dresser I found at a thrift store. It had nine drawers and some amazing swirly details. Disclaimer: While Cece Caldwells sent me paint to complete this labor of love, I supplied the elbow grease, rescued furniture, design concept and opinions within this post! All of which reflect my own point of view, regardless of affiliation! 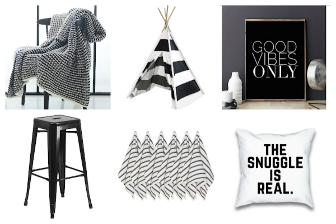 This post may contain affiliate links to products I love and use everyday. This means that I receive a small commission for purchases that are made through these links. You may read our full disclosure for more info. With my mother's height as the inspiration for this furniture makeover, I decided I wanted to add legs to this piece. I was in decision mode as to what kind of furniture legs to attach to this dresser when I passed by an aisle at our local Home Depot and happened to glance over at some fence post tops! Fence post tops?! Could I use those as furniture legs? Yes, fence post tops! At $5.99 a top, I found myself a deal! Here's what they looked like: (Only picture them as unfinished wood and unpainted.) 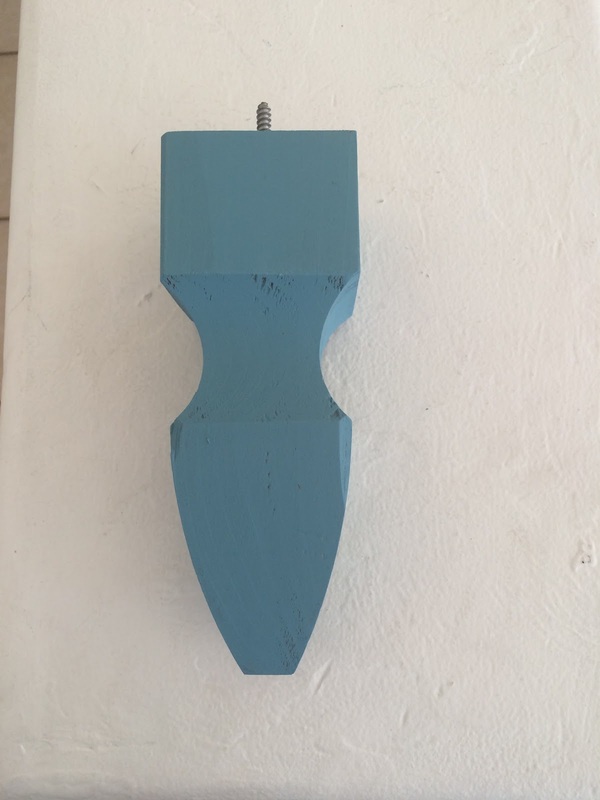 If you turned this post around 180 degrees so that the screw points down, you visualize that's the part that would screw into the top of a regular fence post. But, flip it around and viola!... it becomes a furniture leg. If you're interested in doing something similar you can find these at your local big box hardware stores where they have fence supplies. They were economical AND mine came with the screws pre-drilled. Bonus! Take a look at the upper corner of this next picture. When we flipped the dresser onto its back so the underneath was exposed we discovered that there wasn't a structure to securely attach our new legs to. All four corners were like that. It was hollow with some trim pieces. 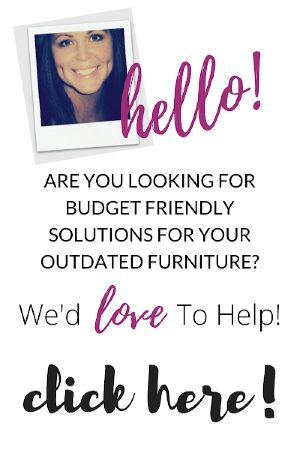 Your furniture piece may be configured differently but if you decide to add legs to a furniture piece (and you SHOULD), I'll show you how we fixed our problem when we didn't have existing supports to work with. 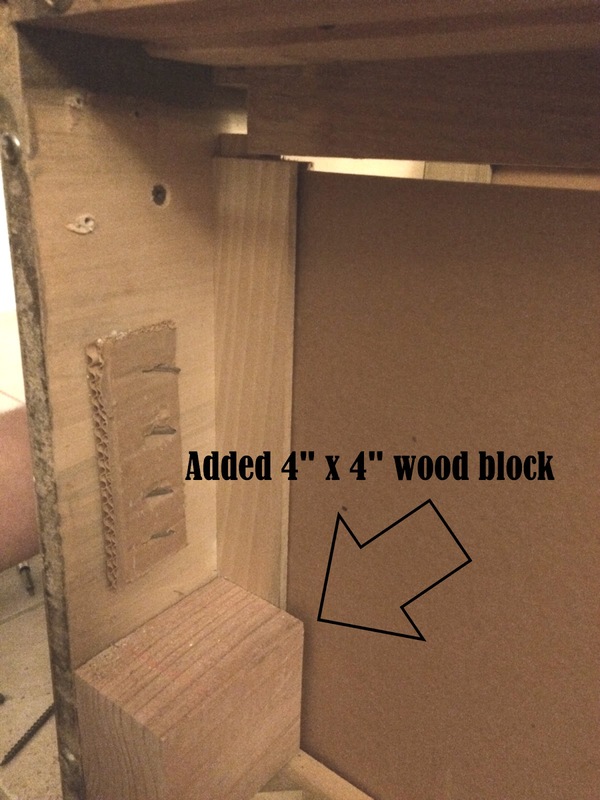 To create supports for the legs to attach to, we cut and added 4" x 4" blocks of wood and secured them into place through the outside of the dresser by insetting the screws. We chose 4" blocks because that measurement made the block flush with the bottom of our dresser. Your measurements might be different. Do you see how we inset the screw holes on the side when we attached the wood blocks? 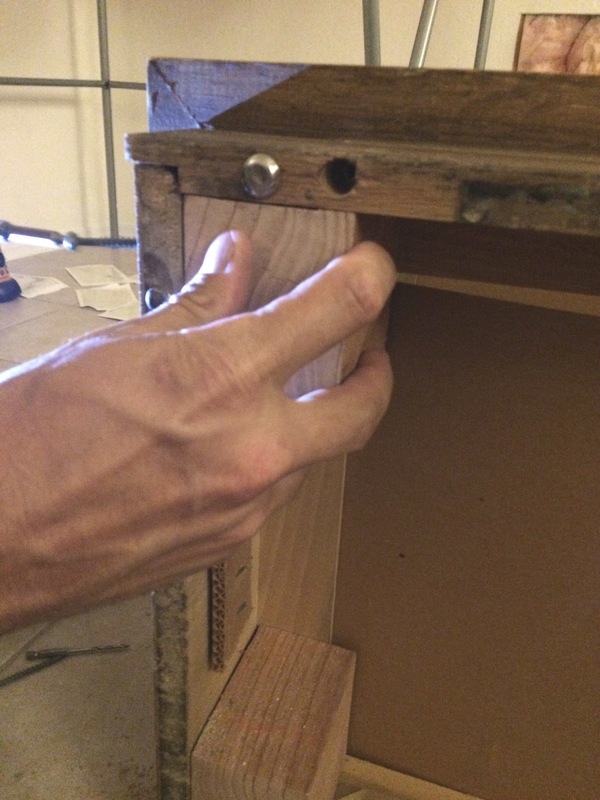 (See below picture) If you inset the screws, then you are able to hide the holes later with some easy peasy wood filler. We used these drill bits right here to create the insets. 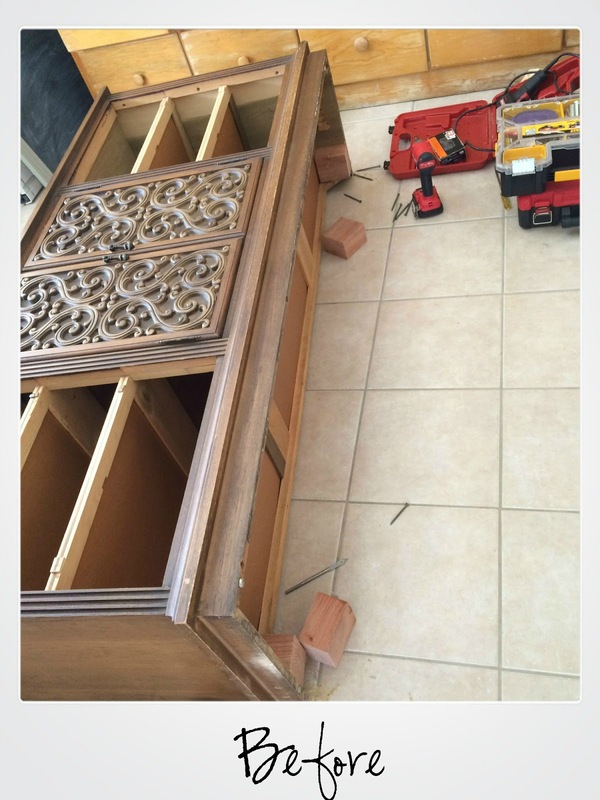 Once the wood blocks were set in place, we flipped the dresser onto its top for the ease of workability. We measured where the fence post would sit on the wood block and where the holes for the screws should be drilled. 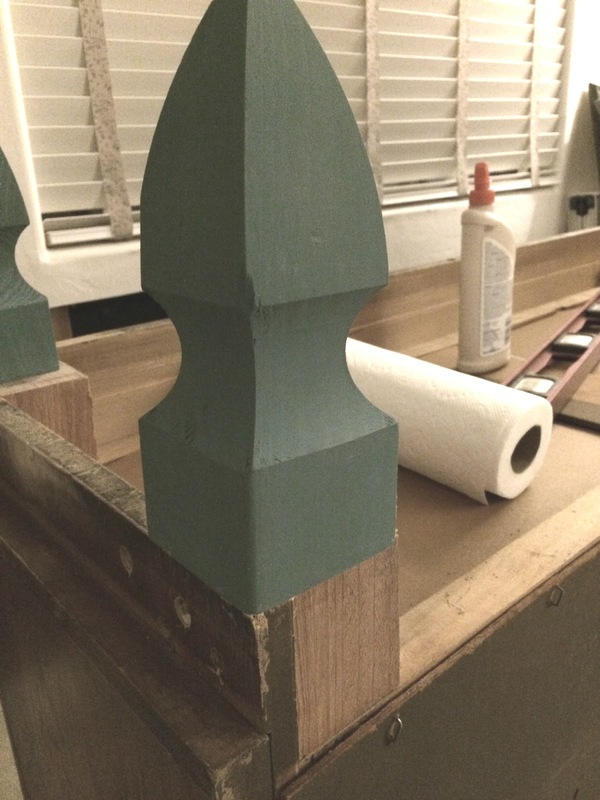 Once the holes were drilled, we applied Gorilla Wood Glue to the wood block and screwed in the fence post top carefully matching up the edges so that they were flush with the sides. On a side note... You don't have to paint your legs first. I just opted to because I thought it would be easier in the long run and I'm all about doing things easy! As you read, you'll discover that I had a paint color change and pre-painting these legs was pointless! But, paint them AFTER you've completed this next step. There's no sense in covering up your lovely paint job with wood filler. After the legs were secure and the glue had dried, we applied Wood Filler to our seams and the outside screw holes. Once the wood filler set, we gave it a really good sanding so the finish was nice and smooth and we were ready to paint! 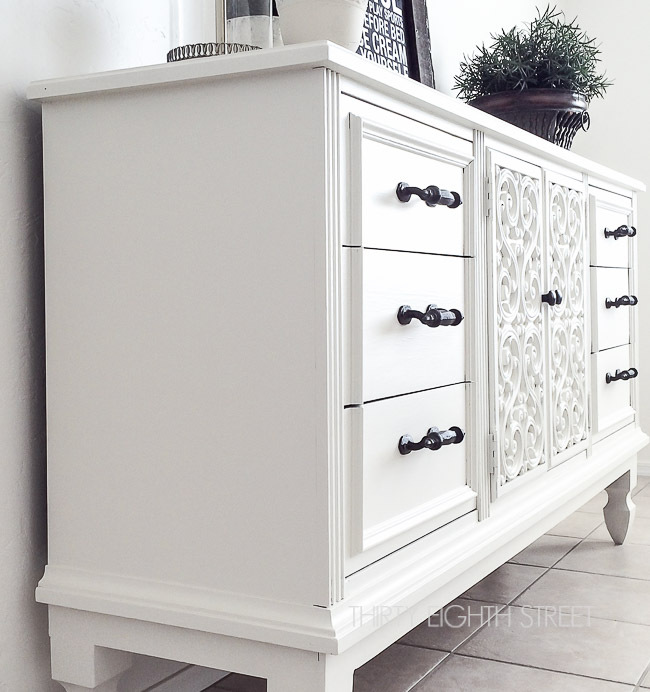 With just a few fence post tops and some paint, the Andi Dresser was transformed into something beautiful, elegant and stately! She has lovely height, new legs and amazing details that pop! 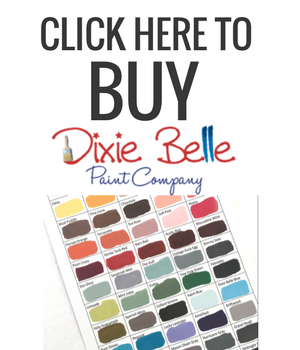 You can find shades of white furniture paint here, here and here. 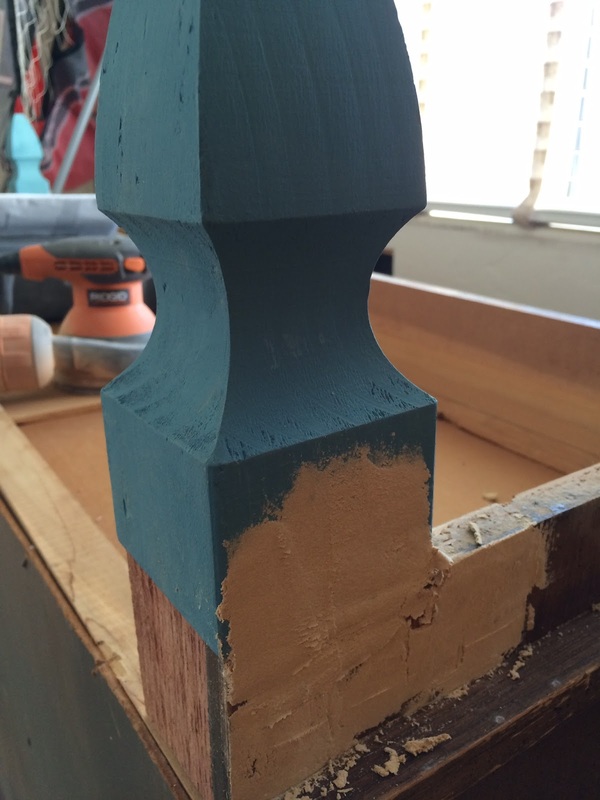 Consider adding legs to your next furniture project? Just because your existing furniture doesn't have legs doesn't mean you can't have them! If you're not sold on using fence posts as furniture legs, here are several unfinished wood furniture leg options that get really great reviews on Amazon! And if wooden legs aren't your style, consider these metal furniture legs for a modern or industrial vibe! Would you like to see additional repurposing furniture tutorials? 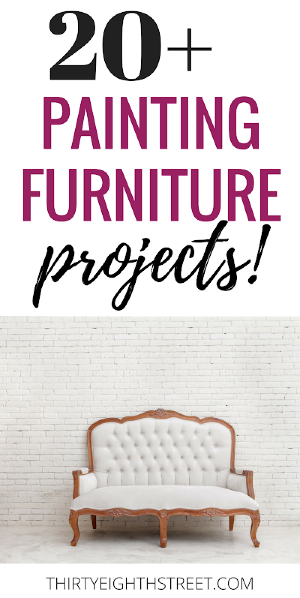 Stop by our Furniture Painting & Tutorials page to see lots more furniture before and afters and learn more tips and tricks! Love the transformation. I love white furniture. So happy to be participating in this co-hosting adventure with you. The feeling is mutual, Michelle! I absolutely love your creations!!!! You have such talent! I also adore your Mom! She is the very best!!!!! Thank you Linda, that just made my day! 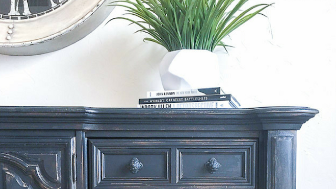 This has to be one of my favorite dresser DIY's to date! I love the fact that you added legs...The legs make them feel more regal. Love it! Wow Jess! Thanks for the sweetest compliment... that made my day! I love that you added the legs to this piece. It makes it look so much better! It turned out beautiful! Adding legs is such an easy thing to do! This piece is being turned into a bathroom vanity. ;) Thanks for the lovely compliment! Adding that style of leg compliments this dresser beautifully. Stunning makeover! I'm glad you liked it! Thank you, Marie! What a beautiful transformation! I don't think I would have ever considered the fence post toppers as legs, but they work fabulously. Thank you for sharing at Merry Monday! This is beautiful! What a great idea for the legs. Pinned and Tweeted. Thanks for sharing at Snickerdoodle Sunday. Thanks for sharing this Beverly! I love the white, and I'm sure your mom did too. What a wonderful tribute to her! This piece is gorgeous, the lines, the woodwork, the legs and the hardware, simply stunning. Great job!! Behold the power of paint! 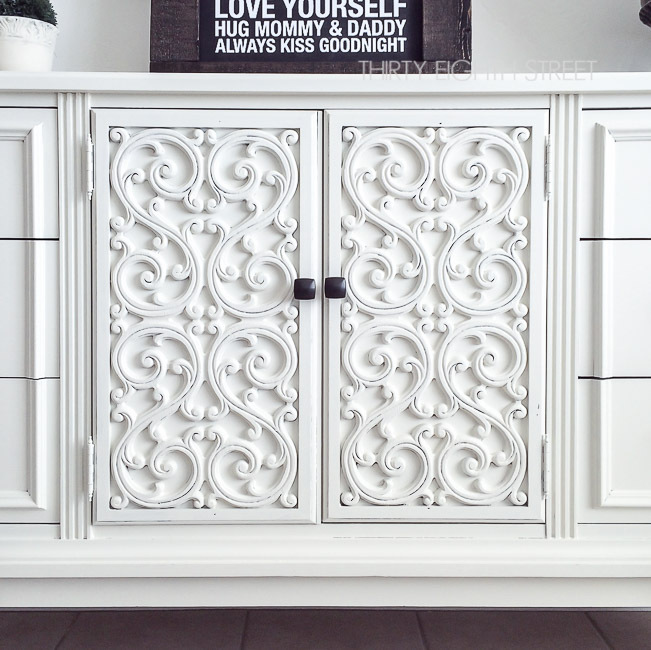 You really gave this dresser new life. Happy to feature you at Be Inspired this morning. Thanks so much for sharing! Wow! This piece looks amazing! The color, the details, those legs... beautiful! Thanks so much for sharing with us at Talented Tuesdays! Gorgeous! You truly have a talent for making furniture look beautiful. Thanks for linking up at the Creative Circle Link Party! Wow! Just the nicest compliment. Thank you! I'm a big fan of this piece. Amazing. 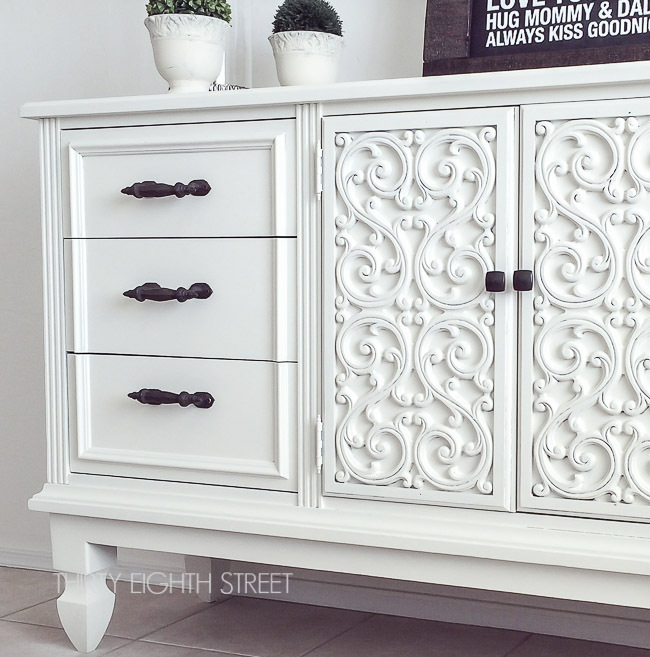 Really like the white with black hardware and the look that is not distressed. If you want to be distressed, look at the "before" picture. I am not one who can envision the final look of a project. Some day I might find myself amidst ugly furniture...but not for long. Thanks for the inspiration. I appreciate your talent. I also have a piece that I want to add legs. However, I am great at copying a look, but to come up with it - nope. My question is how do you know what size legs to add. Is there a "rule" like hanging a picture to be eye height, or personal preference. By the way you do beautiful work, and are an inspiration to me - if she makes it so beautiful, maybe I can too. Thanks. The height from the legs makes such a huge difference! Beautiful. Thank you, Sara! I think adding inexpensive legs gives furniture so much bang for the buck! Hi Amy! I purchased these fence post tops at Home Depot. I'm sure any big box hardware store would carry them. Thank you! Just found them. The other stores weren't as flat on top! Took one look and thought: "ballerina legs"! Lovely job. Thanks for the good photos and explanation of how you did it. New here, but know I'm gonna like it in your neighborhood. 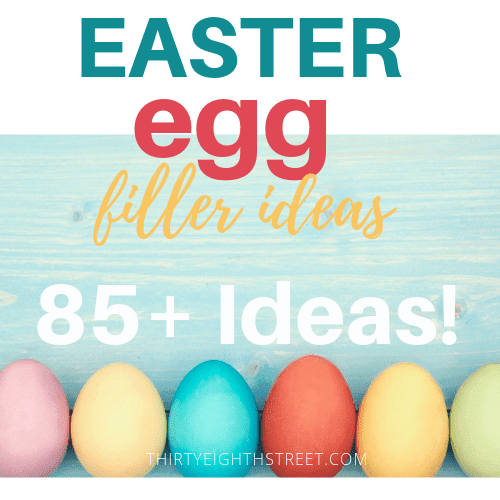 I'm in love with this idea and the creation you came up with! I'm considering adding fence post tops as legs to my solid wood hutch but am worried the stubby 6" tall posts may not hold the weight. Do i need to add additional support?